Data you contribute to Hugo is only accessible by your Hugo team. 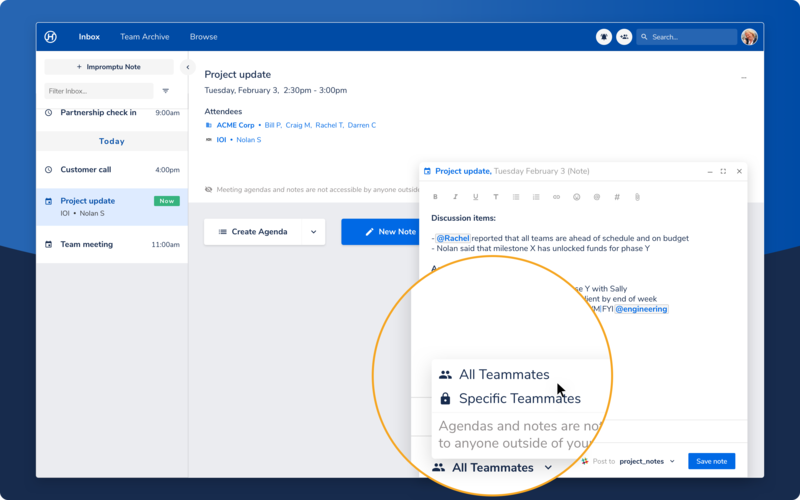 In order for someone to see your meeting notes, they need to be a member of your Hugo team, and be granted access to those notes. Before saving each note, you have to ability to change the share settings from your account default. Hugo stores all of your data on dedicated machines in AWS Data Centers. There is no direct access available to Hugo database via web or SSH from outside Hugo's virtual private cloud and Hugo uses AWS’ firewall and security infrastructure. Hugo's cyber-risk insurer performs an annual audit of data security infrastructure. Hugo has always exceeded their requirements and maintains professional indemnity and cyber-risk insurances annually. Visit Hugo's Security Center to learn more about compliance with and certification across a variety of web privacy standards.